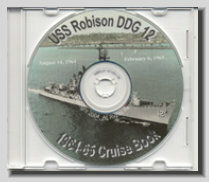 You would be purchasing an exact copy of the USS Robison cruise book during this period of time. Each page has been placed on a CD for years of enjoyable computer viewing. The CD comes in a plastic sleeve with a custom label. Every page has been enhanced and is readable. Rare cruise books like this sell for a hundred dollars or more when buying the actual hard copy if you can find one for sale. This would make a great gift for yourself or someone you know who may have served aboard her. Usually only ONE person in the family has the original book. The CD makes it possible for other family members to have a copy also. You will not be disappointed. A Busy Year for the "Robbie"
The CD book includes 96 pages of pictures of its crew and ports of call. Six minute audio recording of "Sounds of Boot Camp" during the late 50's early 60's.